A golf club manufacturer called us with a simple request; they had to capture clubs that they were issuing to tour professionals. The manufacturer was required to keep track of clubs issued to their clients for tax purposes and asked us to develop a simple system that would capture this data. We chose to use Intermec CK31 hand held computers for this application. The CK31 has a full alphanumeric keyboard, and a linear imager. It also comes equipped with an 802.11g radio, but we didn't use it for this application. 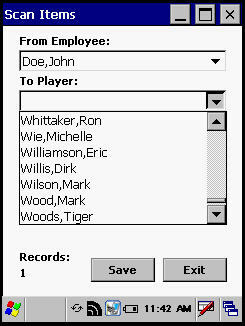 Tables of employee names and golf pros are downloaded into the reader on a periodic basis. These files are used to populate a two pull down list boxes, and to verify collected data. A custom program was written in Opto22's Pac Control Basic language to detect the input from the cameras, synchronize to the conveyor speed, the tray one pulse, and to capture the output from the Accusort scanner. The program sends collected data to Switchboard, our data collection software program, which posts it to an SQL data base by employee ID. 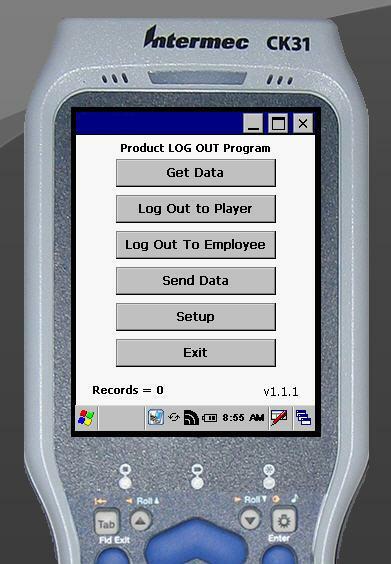 Indirect time is tracked In addition to employee productivity. This customer called many suppliers looking for a system that met their requirements to no avail. This is a simple system, but if your system requirements can't be met by off the shelf software, custom written code is always an option. Custom code will usually be more effective than off the shelf software because it's designed from the ground up meet the unique needs of your application. This system is now running at two locations.